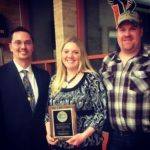 Farmer Danika Wehling and her husband Nathan both came from conventional dairy farms. They both believed in working hard and taking care of the land and animals within the organic standards, so naturally they became organic farmers! They meet in college, living in the same apartment building. Neither one could go home on weekends to easily, but a cousin's farm wasn't to far away which Danika drug Nate to very often for them to both could get their fix of milking cows and fixing equipment. Long story short, they fell in love on the farm and got married as soon as they could with the goals of starting their own farm and tractor repair shop with the support of the community, family & friends. More stories of their past on her blog: www.danikadairydiary.com and follow her on most social networking sites under Farmer Danika. Danika “Dani” Wehling is the agricultural business woman, gardener, Country Store owner and one of the main farmers of Wehling Farms. She milking morning shift, manages overall health, breeding needs and feeds & maintains overall health of all the calves. She also takes care of the chickens with feeding, bedding, and collecting eggs. When farm chores are done for the day, you'll find her volunteering with local organization with goals of agricultural education and Norwegian customs through the area festivals & events. Nathan “Nate” Wehling is tractor mechanic first and a farmer second depending on what day it is! Wehling Farm & Repairs, LLC is his own shop on the farm where he works on his tractors but everyone else too. Decisions on our equipment, tilling, what crops to raise and harvesting along with his daily jobs on the Wehling Farms such as feeding, cleaning & bedding the cows & young stock are all apart of keeping the farm productive. He is a mentor for "School to Work" Program and has also been on the Township Board for many years providing them with a mechanic & farmer minded opinions. Stan Gretebeck is the provider of knowledge of dairy farming. Danika’s Dad grew up as a tobacco farmer and dairy farmer with education from the Madison Short Course and worldwide educational trips to provide his kids and grand-kids the generational knowledge of farming. Danika bought her Dad’s herd of organic jerseys on her birthday in 2014 to add to her Ayrshire herd and he has been milking every morning since. Kathy Gretebeck is the retired secretary of Westby Area High School, farmer, cook, gardener, crafter & professional Grandma. She has skills of crafting and multi-tasking that are beyond most people’s grasp. She provides much of the crafts sold at the Country Store and also works some weekends during the year. Milkers, calf caretakers, tractor drivers, loggers, just about anything we need help with, these guys & gals can seem to handle or will learn quickly to master it! We're very proud of them!